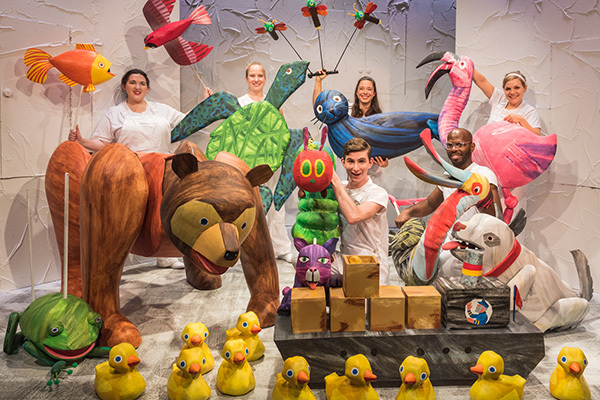 Lisa Condit spoke with Jonathan Rockefeller, creator of The Very Hungry Caterpillar Show, coming to our stage on Thursday, April 4. Read on for highlights from the interview, or listen to the full interview below. Lisa: Was this all your idea? What made you think of it? Jonathan: I can’t take the credit. Eric Carle gets the credit. He gave us such wonderful stories that are loved by so many people. His books are just brilliant. I still have my copies from when I was growing up. I thought, “Wouldn’t this be fantastic as a big and beautiful puppet show?” We do have incredibly large puppets. The butterfly’s wingspan is 12 feet! We want to be sure that kids and families get to experience the books in something that will explode their imagination. Lisa: I’ve been to his museum here in Massachusetts. A lot of people around here have a special love for Eric Carle and his illustrations. This show has been running for five years in nine countries! It’s well honed and very beautiful, but this is a special production. This is the first time that “Brown Bear, Brown Bear” is in the show. This is a proper off-Broadway show that is coming to the theatre. That’s what excites me… to give kids the opportunity for their first show and make it a great one. Lisa: We have multiple generations now who have grown up loving Eric Carle’s books. There is nothing as magical as that live theatre experience, when children and their families and friends are together in an audience and they’re seeing what they’ve only seen on a two dimensional page come to life. Jonathan: There is no greater joy than hearing the way kids respond to this show. The characters are so familiar to them. Eric likes to describe his stories as “book toys.” There is always a sort of surprise to them. Our approach was how can we bring that element of surprise to the show? What does the caterpillar look like from the front? Or the sides? What does Brown Bear look like from the back when he walks all round? How can we bring these two dimensional characters into the third dimension? Lisa: This is a very colorful production. Jonathan: You’re going to be seeing a new puppet on stage about every 45 seconds! If you haven’t been to the theater or are thinking about it, this is the perfect show for the whole family.